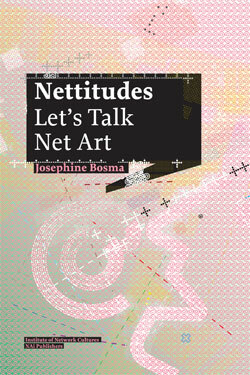 Josephine Bosma, Nettitudes: Let’s Talk Net Art, NAi Publishers, Rotterdam and the Institute of Network Cultures, Amsterdam, 2011. ISBN 978-90-5662-800-0. About the book: Never the darling of the media art institutions and ignored by many curators and critics since its emergence, net art still persists as a ‘non-movement’, residing in the cracks of contemporary media culture. Nettitudes provides an analytical foundation and an insider’s view on net art’s many expressions as it grapples with the aesthetic, conceptual and social issues of our times. Net art is art based on Internet cultures, which revolve around technology, games, social networks, commerce and politics. Net art is still fairly unfamiliar to the general public in the Netherlands, which is odd, given that Dutch net artists have ranked among the world leaders since the mid 1990s. In Nettitudes that prominent Dutch role in net art is clearly evident in the midst of the international examples. Works of net art are almost always interdisciplinary. Whether stage director, filmmaker, sculptor, musician, painter, photographer, writer, poet or dancer, creating net art allows the creator to escape from the corner in which traditional art criticism has held them hostage for decades. A well-known exponent of this artistic trend is Jodi (the Dutch-Belgian artist duo Joan Heemskerk and Dirk Paesmans). The artist Peter Luining and the Internet personality Mouchette.org also enjoy international renown. About the author: Josephine Bosma is an Amsterdam-based journalist and critic who has commented on the fields of art and new media since 1993. One of the first to probe into and engage with the domain of net art, her pioneering work is published internationally in books, periodicals and catalogues. Colophon: Design: Huug Schipper/Studio Tint. Cover: Leon Kranenburg and Loes Sikkes. With the support of the Mondriaanstichitng and Fonds BKVB.